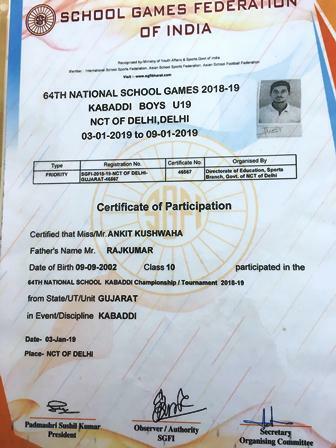 Ankit Kushwah , a student of class X, from Naranpura Branch has represented Gujarat State in Kabaddi Under 19 Championship held in New Delhi from 03 January to 09 January. The event was part of National School Games 2018-19. Selection process for the National Games involved a tough competition at District and State levels and is a singular achievement for the student. School congratulates Kushwaha for his National level participation.